WR-holder sprinter Carol also high-jumps while Charlie expends energy via long sprints and relays. Perhaps Karla del Grande should do jumps. That’s my theory on why the Canadian world-record holder and Malaga sprints champ was left in the dust by countrywoman Carol Lafayette-Boyd for World Masters Athlete of the Year (female divison). W75 Carol had jumps on her resume as WMA considered its annual picks (along with 100 WR of 15.03 and 200 WR of 31.56). W65 Karla didn’t. On the male side, M70 Charles Allie was a safe and obvious choice for Athlete of the Year, announced Thursday. His records for 200 (25.75) and 400 (57.26) this year could stand for decades — if he doesn’t approach them himself. Then Charlie checked his phone and saw my email congratulating him on AOY. He says his wife, Jackie, and their first grandson, Victor, were the first to know after he got back home. I asked Charlie how many sprint years he has left in his legs. “At this point of my track career, I am taking each year as it comes along. I just feel so blessed that I am still able compete and be a part of this great masters T&F organization. His goals for the coming year? Coincidentally, in 2013 Charlie’s female counterpart for AOY was another Canadian — multi-venter Christa Bortignon. This year Christa was runner-up in the multi-events group. I also wrote to Carol, who said she learned of her AOY award when Donna Dixon congratulated her on Facebook from the posting Rob D’Avellar [Jerome] had put up. How many more years of elite sprinting does Carol have left? What are her time or awards goals this coming year? Lots of other athletes were recognized in event groups as well, including two Americans — W60 Lesley Hinz, runner-up in women’s middle distances; and W60 Carol Finsrud, runner-up in women’s throws. 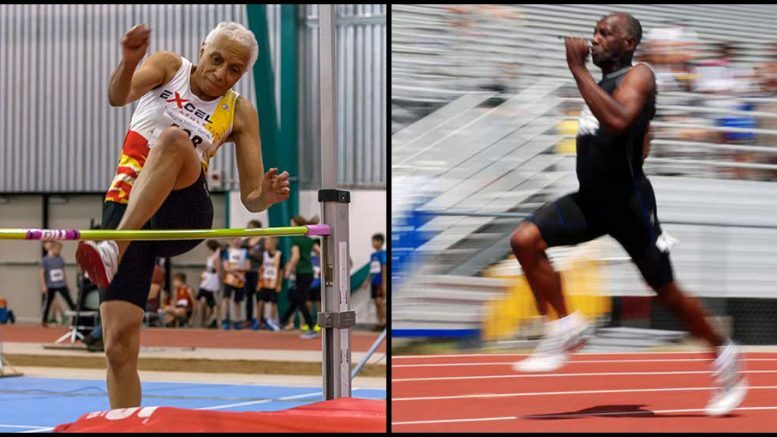 4 Comments on "Charles Allie, Carol Lafayette-Boyd named World Masters Athletes of Year for 2018"
Charles Allie, also known as Charlie, Buddy, and One Speed, is a marvel. Of the 16 world outdoor records in the 200 and 400 available to men below age 75 he owns 5, or 31%. Yikes. I look forward to Mr. Allie’s performances in the indoors in Winston-Salem, where he is entered in the 60, 200, and 400. I haven’t read much about the big meet in Winston-Salem, but I can see that Saturday will be a wild one. On the track there will be the 3000 racewalk, trials and finals in the 60 dash, final in the 1-mile run, trials and finals in the 60 hurdles, and a pair of relays. In the field there will be long jump, pole vault, shot put, weight throw, and superweight. I do hope the announcers are up to the task and are able to pay some attention to all of the events. Without question they will be very tired when they go back to their hotels on Saturday night after their marathon day. Note: I almost forgot; there are 277 competitors entered in the 60 dash, Charles Allie and 276 others. How about that? Congratulations to Charles and Carol. Had the pleasure of photographing them in Malaga. Terrific champions. Kudos also to Lesley Hinz (Middle Distance) and Carol Finsrud (Throws) for doing Team USA proud with their WMA AOY runners-up accolades in their respective events. I love Carol’s comment about how much longer she plans to compete! Congratulations to two inspiring athletes.